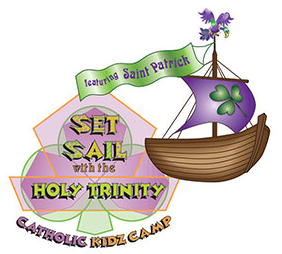 We are very excited for St. Aloysius 24th Annual Vacation Bible School where we will learn about THE HOLY TRINITY! The camp is held on the parish campus (school, church and Stapleton Hall) and runs from 9am-12pm daily. Campers have a daily religion lesson, Arts & Crafts, Music and snack with special events throughout the week. Cost is $70.00 per child. Click this link to register your child: Camper Registration. Volunteers are needed for positions. Please contact Kiana O’Reilly at 917-678-8028 or email kianaoreilly@yahoo.com or Kelly Sullivan at 203-524-0590 or email klynsullivan@gmail.com if you have any questions or concerns. We look forward to a fun week with your children!